This is NerdLacquer It's Just a Flesh Wound. This polish a deep charcoal, almost black, base with red, silver, black, and gold multi-sized and shaped glitter. 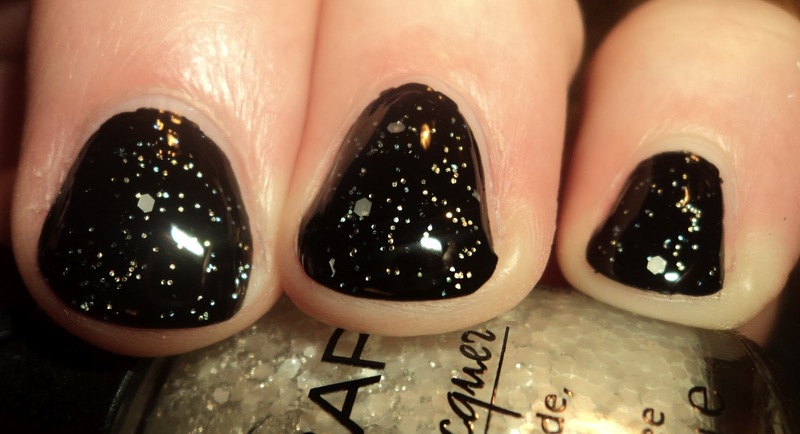 It kind of reminds me of those black with red shimmer polishes (i.e. 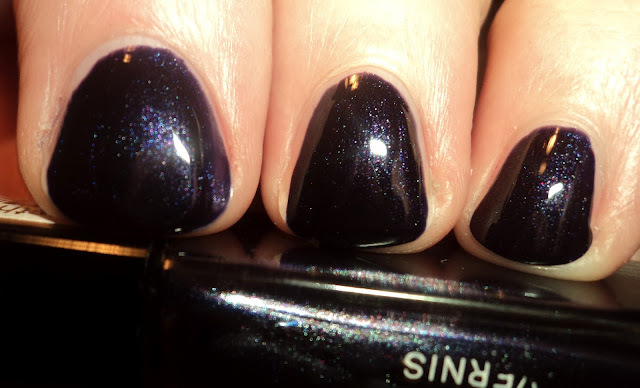 ChG Lubu Heels, OPI Midnight in Moscow, and RBL Black Russian) that were so popular a few years ago. I don't own Black Russian, but I know with Lubu Heels and, especially, Midnight in Moscow, the red shimmer in those polishes seems to sink in to the black base and rather than sparkling, it just ends up looking muddy. However, unlike those polishes, the red (and the gold and the silver) in this polish really stands out. It did eat top coat a bit, so this does have 2 coats of Nubar Diamont over top. Also, I wanted to mention, that in my experience, there was a bit of a learning curve in applying this polish. It's packed with glitter, so if you try to do thicker coats, it will streak and drag on you. I ended up placing the polish on my nails for these 3 fingers. That worked fine, though it was a tad thick which caused some shrinkage on my middle finger after I applied the TC. For the rest of my fingers, I learned to do thinner coats. Once you have 1-2 thinner coats on the nail you can then do a final thicker coat without drag or shrinkage. This is 2 coats on these fingers, but on the rest of my hand, I did 3 thinner coats for the same result. I was easily able to reach opacity without having to apply a base color. 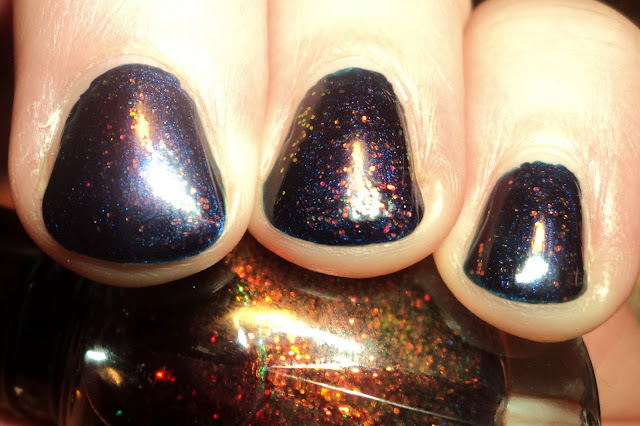 One thing I did want to say is that unlike a lot of other hand-mixed/indie polish glitters, the glitter in this one did not sink to the bottom of the bottle, thus requiring a ton of shaking/rolling. The glitter was equally distributed throughout the bottle. You also didn't have to go fishing for glitter. Unfortunately, this was the only NerdLacquer I ordered. :( I'm going to have to rectify that once they reopen their store. NerdLacquers are available on Etsy, but also at etailers Ninja Polish and Harlow & Co (with the 2 etailers having a few exclusive colors each). Currently the Etsy store is closed and the 2 etailers are OOS on all polishes. Though I'm sure they will be back soon. I purchased mine from Etsy. Cost was $10 plus $2.50 shipping. Sorry for being MIA this week. It's been banana-crackers crazy and I really haven't had a chance to think, much less sit down and paint my nails. Hopefully, things will get less hectic from here. Anyway, as I mentioned in an earlier post, I planned on posting another Blogger Round Up post tomorrow. However, as I forgot to create a reminder post, I'm going to postpone it until Friday, 4/6/2012. So, if you would like to be mentioned in my next Blogger Round Up, and you have yet to respond in a previous post or email me, please reply to this post with your blog URL. I will then create a Blogger Round Up post on 4/6/2012 with all of the Round Up requests. I will also follow those blogs (if you have Google Friend Connect) and I will list you on my Blog Roll. If you are curious as to what is a Blogger Round Up, it's simply a list that I post once or twice a month to help new bloggers and not-so-new bloggers. All I ask is that you aren't a spammer and that your blog be a legitimate blog about nail polish and/or beauty products in general. For more information, please see the "Blogger Round Up" tab above. As luck would have it, I had just received my Barielle order (from their 30% off sale) and figured I'd use one of my new glitters (gnah... it's like crack). 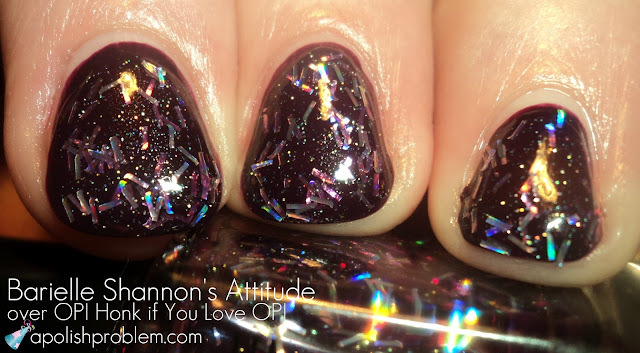 This picture is 2 coats of one of their new shades, Shannon's Attitude (holo bar glitter and small micro-glitter in a clear purple base), over 2 coats of OPI Honk if You Love OPI (a deep, browned plum from OPI's 2011 Fall collection). I also used 2 coats of Nubar Diamont. It's super-pretty and more than a little distracting. LOL. Unfortunately, when I pulled it out of the box, I was a little disappointed, to be honest. This is because it looks nothing like the picture on Barielle's website. 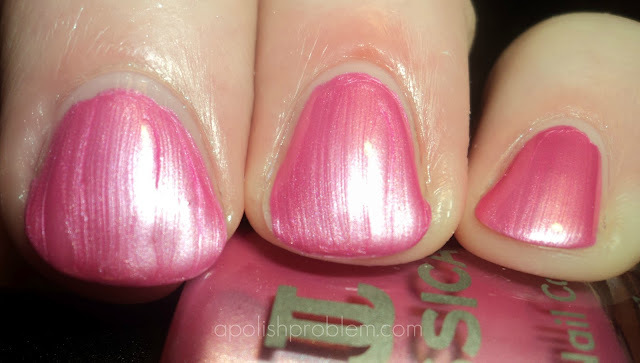 I quickly got over my disappointment, and I now really like Shannon's Attitude, and my birthday mani in general, but I just wanted to give you all fair warning that in real life, this is nowhere near the picture on Barielle's site. Barielle Shannon's Attitude is available on Barielle.com, and it retails for $8, though Barielle has their Shades by Barielle always offered on a "buy one, get one half-off" promotion. QUICK UPDATE - 3/25/2012 - Shannon's Attitude was a complete hit when I went out for my birthday. It shines like crazy. 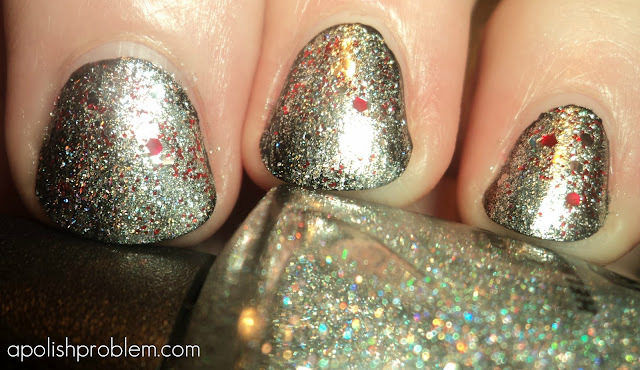 If you love glitter, especially bar glitter, you need this one. Shannon's Attitude was purchased by me. Honk if You Love OPI was provided to me by OPI. I didn't have any application issues, but I did have to use a third coat to reach total opacity, but that's probably because I'm a barbarian and don't use a basecoat. LOL. That said, I was completely amazed that this type of color could look so saturated. Usually, pale colors have a tendency to look washed out or watered down, no matter if they are sheer or not. Zoya Megan is from their 2011 Winter Feel collection. Zoyas are available from zoya.com and from other retailers and online sources. If you are interested in this grey Megan, be sure that you are purchasing ZP593 rather than the old milky cream Megan which was ZP362. 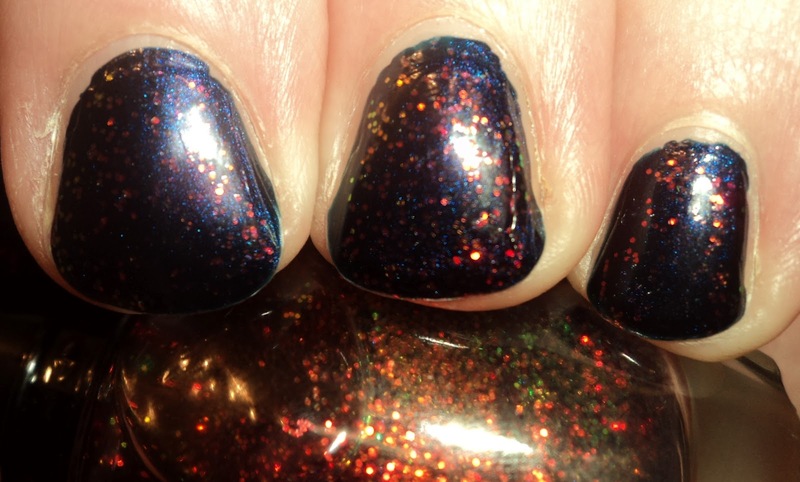 The older version of Megan is no longer available on Zoya's website, but I have seen bottles floating around eBay. Isn't she pretty? And dirt cheap, too. This bottle was $1.97(!!!). You do have to work with it a little bit to get the glitter to do what you want it to do, but that's pretty typical for this type of glitter. Happy Friday and I hope you guys like this one. FYI... the Blogger Round Up will be next Friday, so be sure to reply in the latest round up post if you are interested. I will also post a reminder post early next week. Carly - deep purple metallic. Of all the polishes in this collection, this is the one with the most variation in the shimmer. Rather than being simply silver or gold, the shimmer in this one is pink and blue. It's almost like a foil-y, lighter version of OPI Ink. This one had perfect formula and was almost a one-coater. It was also had the glossiest finish of the six polishes in this collection. 2 coats. 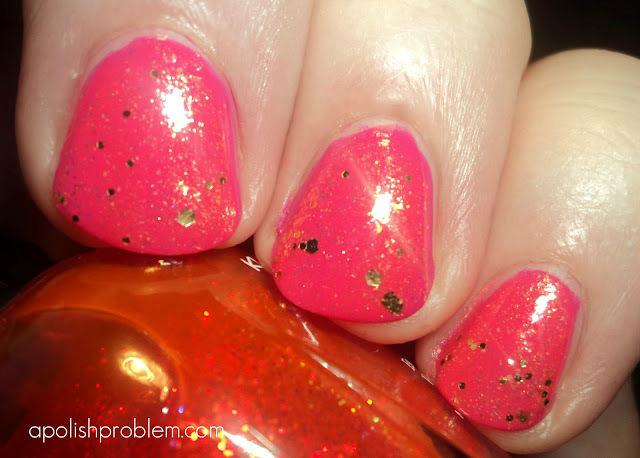 Kimber - bright, strawberry red-pink with golden shimmer. The shimmer in this one is golden, rather than silver, and it reminds me of a foil-y version of China Glaze Strawberry Fields. I loved this one on my nails and I can't wait to wear it as a manicure. Meg - lime green foil. This one, like Tracie from Beach, had me struggling a little for a color descriptor. It's a little darker than what I consider a lime green, but it's very close. However, it's not as bright as Zoya Apple from last year's Sunshine collection. Zoya describes it as a "mermaid green", but in my mind, that means it has a good amount of blue in it, and this one has no blue. This one had a satiny finish due to the amount of foil. 2 coats. Myrta - red-orange metallic. This one gave me the most problems in trying to describe it. It's not a true orange, and it's not a true red, and it's not a true pink, though it has elements of all 3. It kind of reminded me of OPI The Show Must Go On from the 2010 Burlesque collection, though Myrta is more orange-y and brighter. Like Kimber, this one had golden shimmer, though it is much more subdued in this polish. 3 coats, but it was fine at 2. Rory - light pink foil. 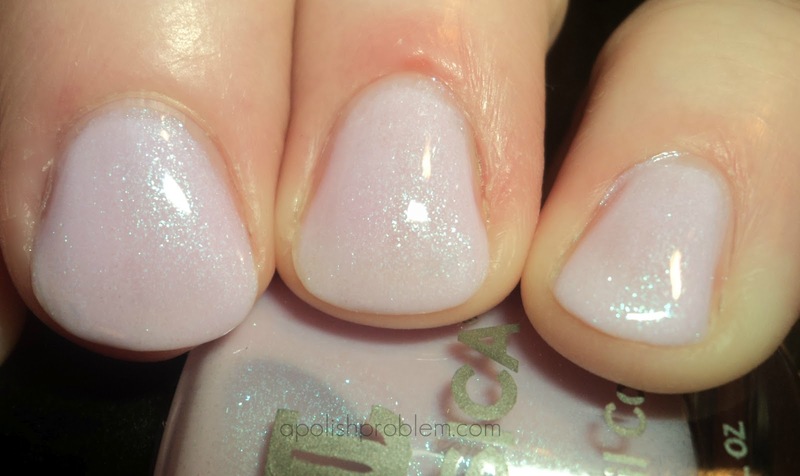 If Glinda the Good Witch had her own Zoya polish, this one would be it. This one had so much silver in the finish. The pink is light and very girly. I think this one would look fantastic in the summer. 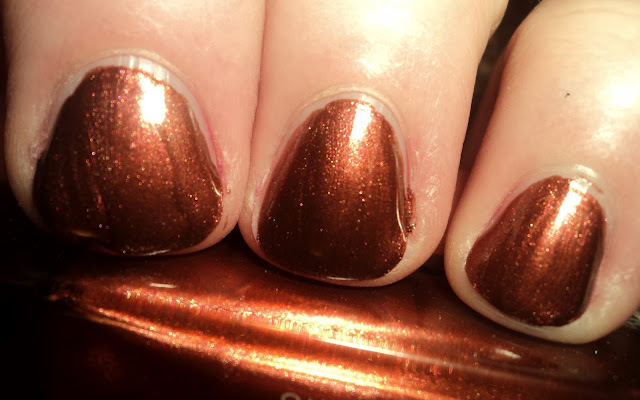 Like Meg, this one dried to a satin finish, because of the amount of foil in the polish. 3 coats. 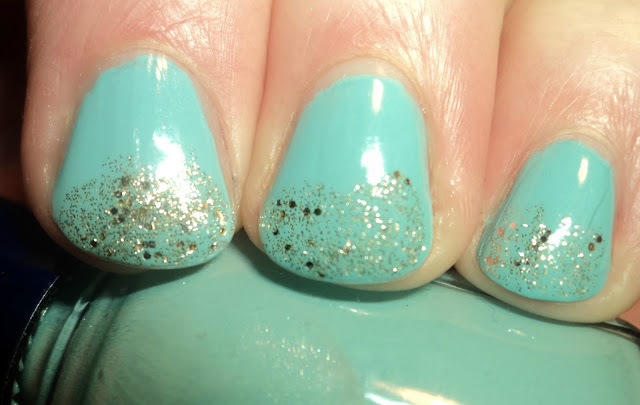 Zuza - aquamarine metallic foil with faint golden shimmer. I think Zuza my second favorite in this collection, behind Carly. This one had a silvery foil finish and like Rory and Meg, it was also very satiny. The formula on this one was fantastic. 2 coats. All in all, like with Beach, I am in love with this collection. Perhaps, I love it even more than beach. I stated that Carly and Zuza are my favorites, but honestly, there isn't a single color in this collection that I was "meh" about. Zoya polishes are available at zoya.com and retail for $8 each. This collection, with Beach, should be available starting 4/1/2012. To view my post on Zoya Beach, please click here. Arizona - bright, sherbet orange creme. Okay, so someone at Zoya is a Grey's Anatomy fan. LOL. Arizona is a bright orange creme, though it's not traffic cone orange. It's definitely in the sherbet family, though darker and brighter than say, a creamsicle. This one is a perfect summer shade. Normally, I find that the formula on orange cremes can kind of be hit or miss, but I had no issues with this one. I did use 3 coats to make sure I had covered any thin spots, but if you used a sticky base coat, you would probably be able to do 2 coats. Lara - cherry pink creme. This is such a pretty color and another one that is perfect for warmer weather. I love bright pinks in summer and this baby is gonna be no exception. Actually, all 3 of the pinks in this half of the collection are fantastic. 2 coats. Reagan- bright, magenta creme. As there are 3 pinks in this collection, you can think of them as sisters. Lara would be the middle child and Reagan would be the big sister. It is more purple than Lara and is deeper in tone, but they are definitely related. 2 coats. Shelby - strawberry pink creme. So if Reagan is the big sister and Lara is the middle child, then Shelby would be the baby, but she is no "baby pink", by any means. I am absolutely smitten with Shelby. The color is beautiful, and reminds me of Jelly Belly Strawberry Daiquiri jelly beans (my favorite). I love that it's a light pink, but it's by no means sheer or pale. I think this one is tied for my favorite of the Beach polishes. 3 coats. Tracie - light green foil. Tracie is the odd duck in the collection and she was also my problem child. When I first saw the bottle, I thought it may be a more pigmented version of Zoya Gemma, but it's not. 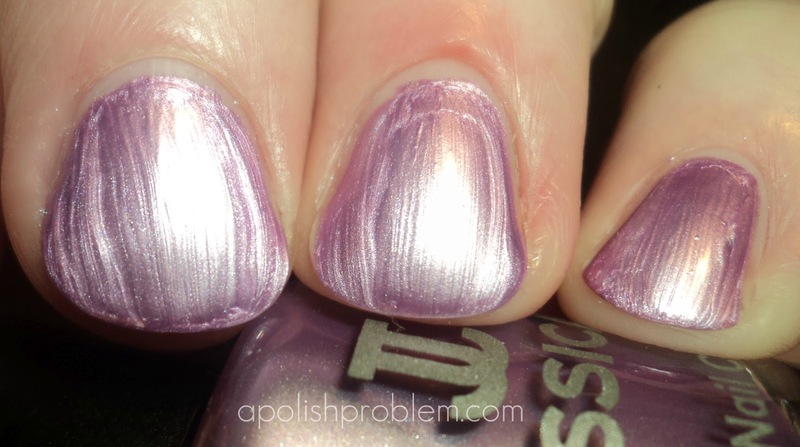 What appears to be silver shimmer in the bottle, is actually a slightly foil-y metallic finish, though it's not like the foils in Beach's companion collection, Surf. The color is a bit hard to describe. In my picture, it looks almost like a light lime green, but IRL, it's a little more murky and olive-leaning, and it did give me a slight case of red-hands. I did have some issues with the formula, but nothing that makes me say this is a no-go. 3 coats. Wednesday - aqua blue creme. This one reminded me of the color of sea glass, so it's a perfect fit in this collection. It's also tied with Shelby as my favorite of the collection. This is an amazing aqua blue. I did have a slight problem with it not wanting to level out, but this color is so perfect that I can deal with a small formula issue. If you love aquas and turquoises, you need this one. 3 coats, though I mainly just applied the third one to see if I could level it out a bit. All in all, I love this collection. I know Zoya does some gorgeous glass-flecked shimmers and foils, but if there is something they do amazingly right, it's cremes, and this collection has 5 fantastic cremes. Tracie is a beautiful color and would great as a summer pedicure, but the stars of this show are the cremes, with the stand-outs for me being Wednesday and Shelby. Zoya polishes are available at Zoya.com and retail for $8. The press release states that Beach will be available on 4/1/2012. 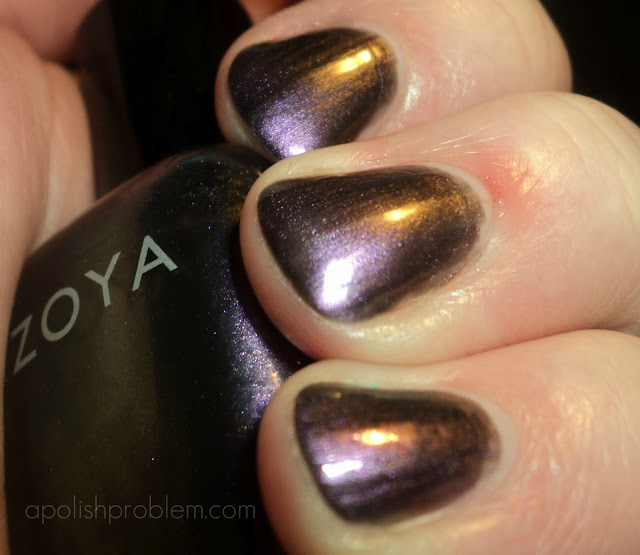 To view my post on Zoya Surf, click here. I received this release a couple of days ago, and though it's already made the rounds, I thought I would also share it with you. Find Zoya BEACH and SURF as well as over 300 other ultra high-fashion Zoya shades at http://www.zoya.com/. As always, each and every Zoya color is made for women so we name them after women. I am really intrigued by this collection. First off, there's a Meg. I'm sure by now, you all know my name is Megan, though my sister and various members of the family call me "Meg". In fact, my personal email is megw...@... So, I love the fact there is a Meg named polish. I also think that Shelby is gorgeous. In fact, there are several gorgeous colors in this collection, and there are 2-3 already on my wishlist. So, as I was thinking of manicures to do for today, I went back and forth about what to do. It seems like the big trend this year is water marbling. Water marbling terrifies me. I'm such a total spazz that I would end up covered in nail polish. It would also be all over my table and my sink. LOL. I thought about a konad, because I do have a shamrock stamp, but then I realized I don't have all the supplies to konad anymore and I didn't feel like going to Sally's to pick them up. Then I saw a tutorial on Julep's FB page on how to create a shamrock. I thought that would be easy-peasy and perfect for today. Then I realized that painted-on shamrocks did not need to be green, and the perfect idea was born. I feel like I practically forced this manicure in to existence, as I had to remove it once and then apply it again. I almost gave up and applied a boring green creme and let that be that, but I was stubborn and wanted (most of) the idea in my head to end up on my nails, as that seems to be a bit of a problem lately. LOL. So, this is week later than I planned, but here is the latest edition in my Blogger Round Ups and the first since I recently restarted the post series. Be sure to check out these fantastic blogs! If I have listed in you this Round-Up, please note that I have followed your blog, as well as listed you in my blog roll. If you would like to be in the next Blogger Round-Up, please reply to this post. As you all probably know by now, I am currently in a glitter-obsessed phase. I can't seem to wear anything on my nails that isn't covered in glitter in one way or another. Today's manicure is no exception. If you are anything like me, you may think about possible manicure ideas before going to sleep. Sad, but I guess that's goes with the territory. Well, this idea came to me last night, as I was falling asleep. I started with a base coat of Bewitching. I then added a thin coat of Your Royal Shineness and a thin coat of Paris Couture for Sure. I then added another thin layer of Your Royal Shineness and Paris Couture for Sure. So there are 2 coats of each but they are layered. I then added a coat of Crown Me Already! and Gettin' Miss Piggy With It, and sealed the whole thing in with Diamont. Sounds like a ton of coats, right? Well all in all, it was 8 including topcoat, but being that I used extremely thin coats of each one, with the exception of Bewitching, which was just a normal coat, they were almost like half-coats. I used dry drops so it was dry within minutes. It only took me about 30 minutes, too. Maybe tomorrow, I should step away from the glitter. Yesterday's Nails - Zoya Robyn with OPI Gone Gonzo! 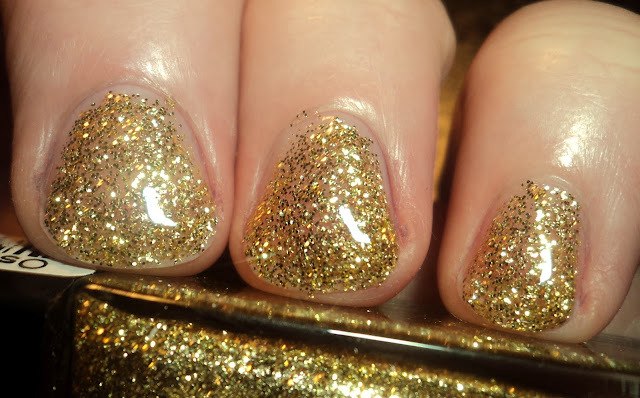 Yes, I realize I just did a "glitter tips" NOTD a couple of days ago, but I'm telling you guys... I am obsessed with glitter right now, so this might be a common occurrence. LOL. 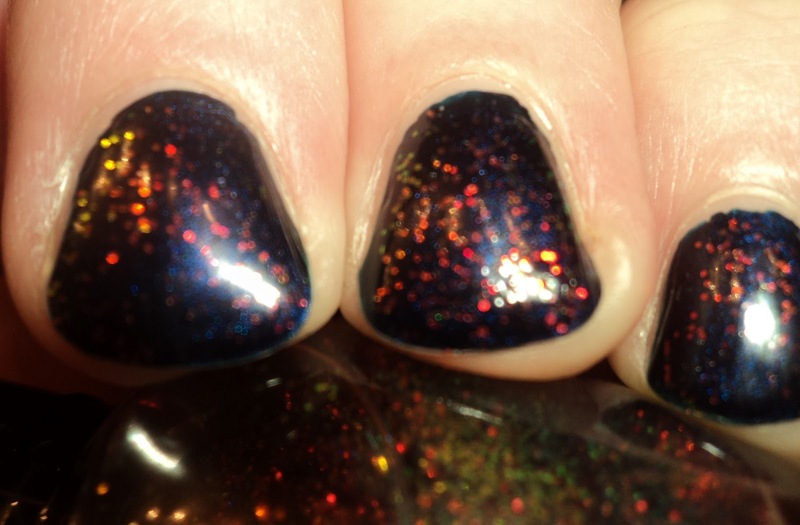 Anyway, this is 3 coats of Zoya Robyn topped with one coat of OPI Gone Gonzo! Robyn is from Zoya's Summer 2010 collection and Gone Gonzo! 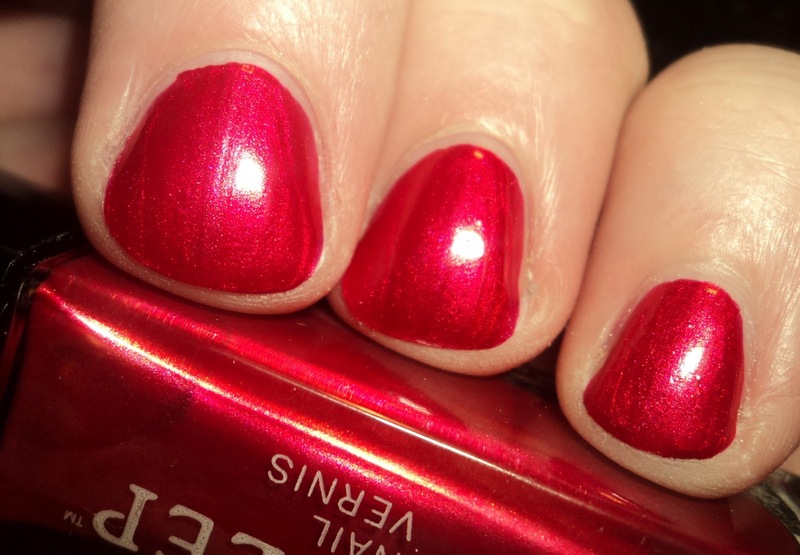 is from OPI's Holiday Muppets collection from last year. I am really liking blues right now, and this turquoise blue is no exception. One thing I will say... it reminds me of my prom dress, and that's not a good thing. I went to prom in 1993 when the dresses were glittery, shoulder pads were thick and hair was a mile high. Anyway, my dress was just a tad darker than this shade, and had lace, pearls, and... sequins going down the lace sleeves. It was god-awful and in fact, my best friend wore it as part of her Halloween costume a few years later. It was that bad. Okay, so calling this one "Yesterday's Nails" is a bit of a misnomer, as it only lasted about 30 minutes, but I wanted to show it to you nonetheless. In some regards, Zoya is one of the most tempermental formulas, IMO. 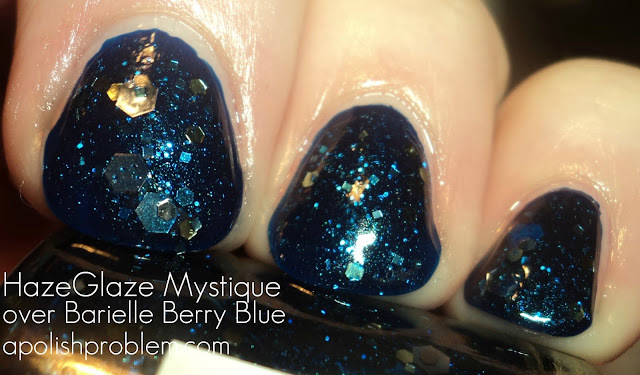 I love the colors, but you have to really know what base/top coats work with Zoya and your body chemistry and Nubar Diamont, Zoya Ki, and my chemistry did not play nice with this one. It was still gooey after 30 minutes, so I gave up and took it off. Again, I'm trying to use some older polishes in my NOTDs, and I've had this one for awhile. IMO, it is quite similar, IMO, to Zoya Adina, and I have to say that I think I actually prefer Adina. However, that said, it is a fabulous color. One that I would like to try again with the right combination of basecoat and topcoat. It is a beautiful smoky purple shimmer that shifts to green. The color shift was hard to get with my camera, but you can somewhat see it on the second picture. Normally, green-shifting polishes don't look all that great on me, but this one looked better than most. The formula is thin and I had to use 3 coats to reach full opacity. Hope you all don't mind the watermark on my photos. I know I've never used a watermark before, but I had to edit out a cut on my cuticle (trust me, you didn't want to see that), so I figured I'd play around with a watermark. I actually like it. Yesterday, I received an email from a Production Assistant on the ABC Daytime talkshow, The Revolution. They are looking for women in the New York City area that have questions regarding their nail health. DO YOU HAVE QUESTIONS ABOUT THE HEALTH OF YOUR NAILS? ARE YOUR NAILS YELLOW OR BROWN IN COLOR? DO THEY HAVE BLACK STRIPES? DO YOU HAVE HORIZONTAL BANDS OF DISCOLORATION ON YOUR FINGERNAILS? ARE YOUR NAILS EXTREMELY LONG (MORE THAN 10 INCHES)? OR ARE YOU JUST CURIOUS ABOUT YOUR NAIL HEALTH AND WHAT IT MEANS? ABC THE REVOLUTION WANTS TO HEAR FROM YOU! 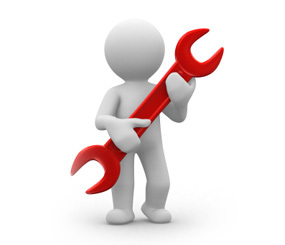 PLEASE YOUR NAME, CONTACT INFORMATION AND PICTURE TO CASTING@THE-REVOLUTION.COM AND THE SUBJECT LINE "NAIL HEALTH." 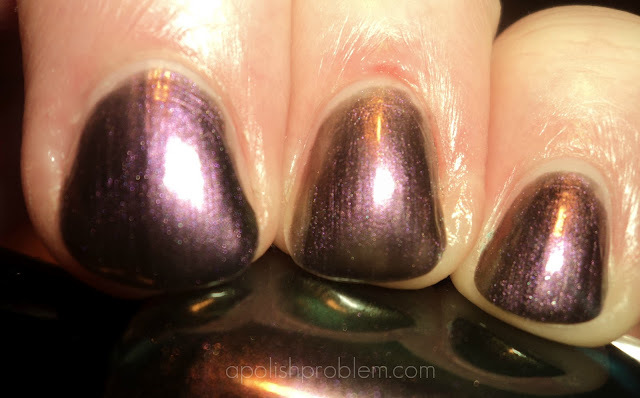 Adios MoFo is from BB Couture's 2010 Cantina Nights collection, of which, I had the priviledge of reviewing. However, as this blog is always a learning process, my review and pictures weren't that great. Click here and you'll see what I mean. LOL. So, in my quest to dig older polishes out of my storage and use them as my NOTD, I figured I'd give this one another go, and I am so happy I did. Adios MoFo is a beautiful light blue. It leans a little aqua, so it almost looks like a Tiffany blue, IMO. It's not exact, but for me, it's a Tiffany blue that works with my skintone, as most polishes in that shade family (i.e. China Glaze For Audrey), give me a major case of lobster hands. This one also has a faint shimmer finish. It was opaque in 2 coats. 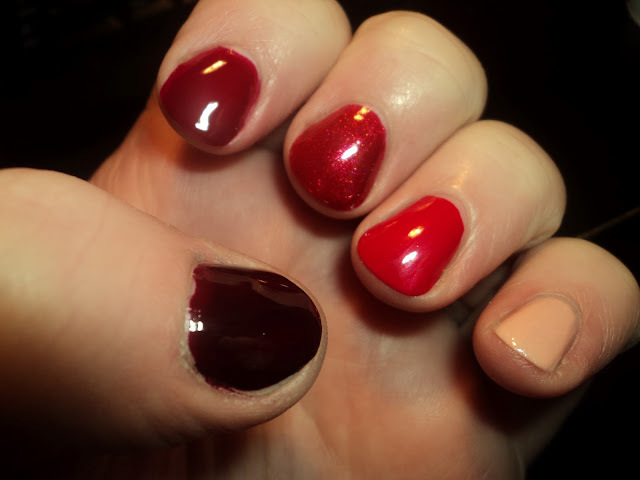 I then topped it with one coat of OPI Spark de Triomphe from OPI's Serena Williams collection on the tips of my nails. I love this. It's sparkly and beautiful and reminds of jewelry. When ombre manicures first started trending a couple years ago, I didn't like the look. It seemed like skittles, only a lot more work. Then it started to grow on me. Unfortunately, creating a good ombre manicure does take a bit of skill in selecting your colors. You have to have the right mix of colors, and textures to create the perfect look, and that's a skill I just don't have. Thankfully, The New Black takes the stress out of creating an ombre look. They have put together several ombre shade kits. I received 4 of them for you and today, I have for the pink kit, that they call "Rover". Anyway, on to the polish... Again, The New Black's individual colors do not have names. From my thumb to my pinky, they are in order, a deep burgundy, a pink-red jelly, a pink-red shimmer, a bright pink shimmer, and a pale pink with fine silver and pale pink shimmer. Individually, the colors aren't unique, but I do want to say that the pale pink in this set is the best of the bunch. It's exactly what I wanted Zoya Gigi to be. It's completely opaque in 3 coats. Whereas, with Gigi, I struggled with 4 coats and I could still see my nails as if I only had on a topcoat. I really like this look. I think it is so cool how they tie 5 seemingly different colors together. They are all different, except for being pink, but they work so well together tonally. No, like I mentioned above, the colors aren't incredibly unique, and if you have a large collection, you probably have dupes in your stash, so you could probably duplicate this look. That said, I know if I tried, I would drive myself batty trying to find colors that worked so well together. They have taken all the guesswork out of ombre manicures, and that is the best thing about these little kits. The New Black Ombre kits are at $22 for 5 mini bottles and you can find them through various retailers such as HSN, Nordstroms, and Drugstore.com. I had been wanting to dig Russian Navy out of the depths of my storage container for a few days. 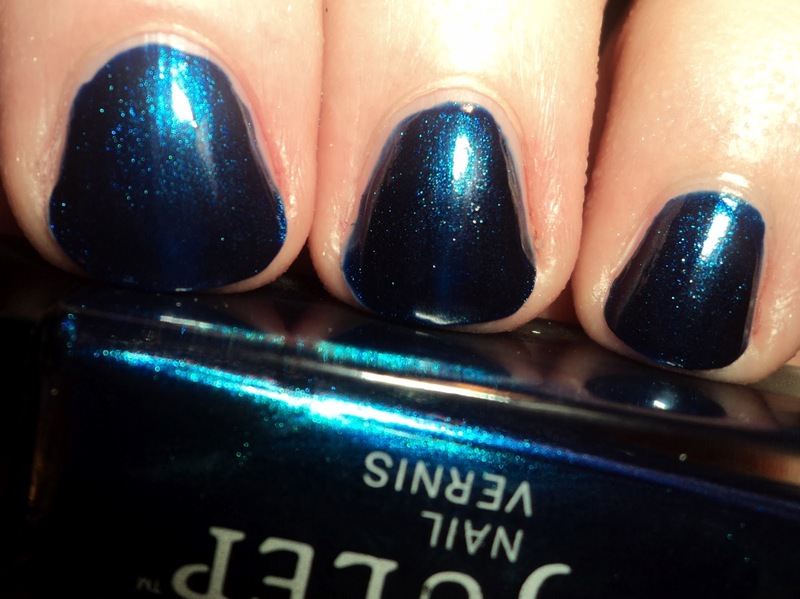 Russian Navy is one of those colors that it took me several uses to like it. 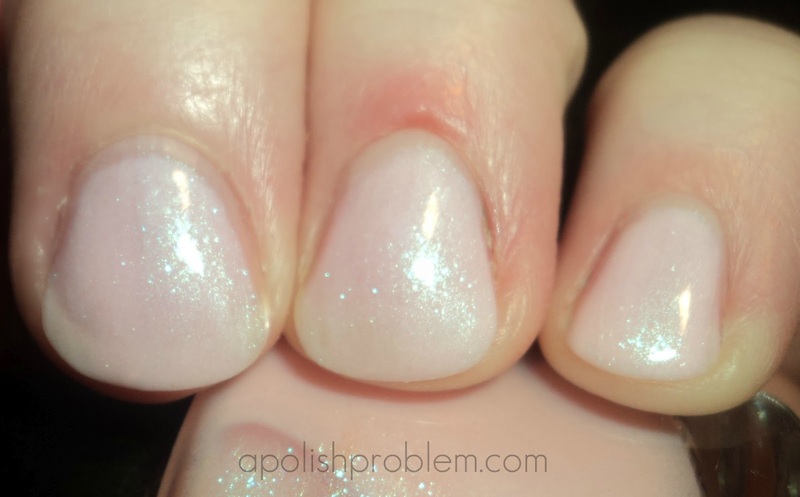 When I first got it, right after the OPI Russia collection came out, I loved it in the bottle, but hated it on the nail. At the time, I had acrylics, and I thought it just was too much on the long nails. However, once I tried it on shorter nails, I liked it much more. Unfortunately, right after I applied my manicure, I got tip wear (grrr), so I decided to apply something over top. My first thought was to do glitter tips and then I saw Klean Color Chunky Holo Bluebell in my glitter/holo drawer. 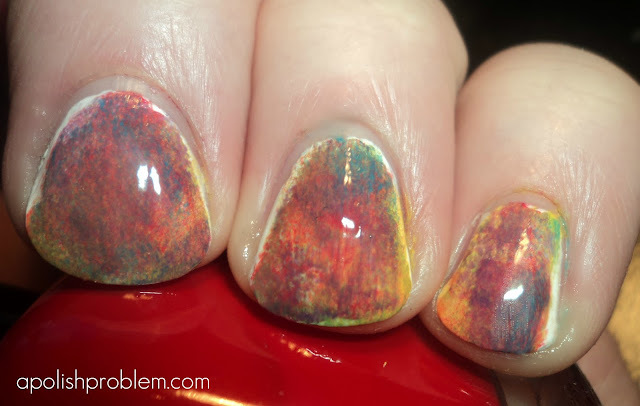 I adore these Klean Color Chunky Holos. Bluebell is a slightly blue base with random-sized multi-chrome (green, gold, red) glitter. I think this is a fabulous combo. Recently, I was contacted by a beauty editor for Makeup.com to submit a tip for a long-lasting manicure. My tip was to properly prep your nails by using a dehydrant, as well as a sticky base coat. I am so happy that they used my tip, that I wanted to share it with you. Please click here to go the article on makeup.com. My tip is #5, and there is also some great information in there from 4 other bloggers, as well as Essie Weingarten, so be sure to check it out. By the way, the picture at the top of the article is of my nails and I am wearing OPI Designer Series Desire. A few days ago, I looked at my blog roll and realized that many of the blogs on there are no longer live or haven't been updated in awhile. Now, I realize I'm the last person to say something about someone not updating a blog and I completely realize that life gets in the way, but I still wanted to take some time to clean up my blog roll. I want to delete older, inactive blogs and list newer blogs that never made it to my list before my hiatus. Over the next week, I will be checking all of the blogs listed in my blog roll and any blog that hasn't been updated in 6 months will be taken off my blog roll. I am mentioning this because I think it gives me the perfect opportunity to list some of the new blogs. If you have a blog or a blog that is not currently on my blog roll, and you would like to be listed in my blog roll, please reply to this post and I will be more than happy to list your blog when I am in the process of cleaning up the list. Also, I wanted to mention that I will be planning on restarting the Blogger Round Ups. There are so many new blogs out there that I want to do these again to help as many new bloggers as I can. For now, if you would like to be in the Blogger Round Up, simply reply to this post. When I add you to my blog roll, I will also create a Blogger Round Up post. The next Round Up post will be on Friday, 3/9/2012. Going forward, I will reopen my Blogger Round Up form. Once I start the round ups, I will begin using information gathered from that form for any new participant. Before I slacked off on the blog, I know several of you filled out my Blogger Round Up form, and I never listed your blog. If you have previously filled out the Blogger Round Up form, please let me know by replying to this post and I will find your information and add you to my blog roll, follow your blog, and list you in the Blogger Round Up. I am trying to start a new post series called "Yesterday's Nails". This will basically be my manicure from the day before. It's so easy to get caught up in reviews, and I want to start posting more picture of my daily looks. This also makes me keep polish on my nails. 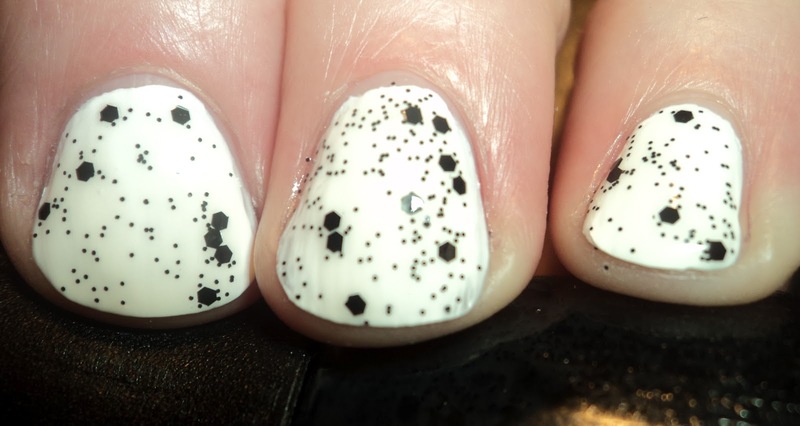 This look is 3 coats of China Glaze Happy Go Lucky, from their Spring 2010 collection, with 2 coats of Nubar Black Polka Dot. I am in love with this yellow. Can't say enough about it, and if you want to try yellow, I would 100% recommend this one. No, it's not a pale yellow, but it's super fun and I find it to be very wearable. 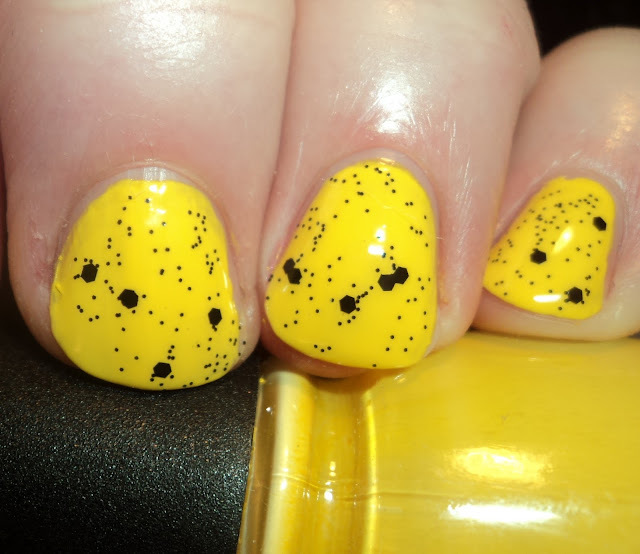 Like a typical yellow polish, it does take 3 coats to reach full opacity, but the formula is good, so it's not a big issue. And because I'm now obsessed with it, I added Black Polka Dot. If I did this NOTD again, I would probably use white as an accent nail on my ring finger, but by the time I thought of that, I was almost done. LOL. Also, I added one coat of Nubar Diamont, and I have to say that this is now my new favorite top coat. It applies super easy and is dry in minutes. It also makes your nails super shiny. Dear Nubar, please don't change it again.